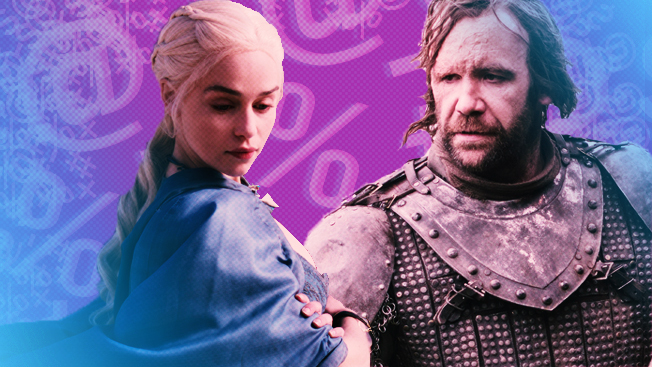 Here are the 10 most interesting numbers from the digital marketing space in the last week, including mind-boggling stats from Game of Thrones and surprising data about the future of streaming-based advertising. 1. Tech vendor Zefr found that 99 percent of Game of Thrones videos on YouTube are user generated. So even though the HBO show has an impressive 160 million views and 919,347 subscribers to its branded account, its channel creates but a sliver of the nonstop GoT buzz on YouTube. 2. Still unconvinced that virtual reality is becoming a thing? Well, Jim Beam is taking Oculus Rift-powered Samsung Gear headsets into 250 bars in 16 of the country's biggest markets in the coming weeks. Following in the footsteps of Dos Equis, Mountain Dew and Red Bull, the liquor seller is just the latest major brand to dive into 360-degree-enhanced marketing. 3. Over-the-top (OTT) devices like Apple TV and Roku will generate $31.5 billion in advertising by 2018, up from $8.4 billion this year, according to The Diffusion Group's new numbers. By 2020, the space will hit $40 billion, per Diffusion Group. 4. Kik, which has 200 million users, has flown under the radar due to all the hype around Snapchat in the last year. But brands are finally starting to catch on to the millennial-focused mobile messaging app, Digiday reports, including 60 marketers. Ten million of Kik's users have opted to receive branded content. 5. The Ad Council's "Love Has No Labels" spot, created by R/GA, got 47.6 million YouTube views in March. For the month, the three-minute, 20-second video was No. 1 on the YouTube Ads Leaderboard, which is a regular Adweek/Google chart. 6. In the last two years, 64 percent of social media mentions for golf brands like TaylorMade, Ping and Cobra happened on Twitter, according to MVPIndex. Twenty-two percent of golf product chatter occurred on Facebook, with 14 percent on Instagram. 7. Millward Brown Digital surveyed more than 1,000 consumers in three generations (millennials, born after 1980; Generation X, born 1965-1980; and baby boomers, born 1946-1964) to see how different age groups favored digital screens for various activities. Boomers love to purchase via laptops, while millennials prefer smartphones and Gen Xers fall somewhere in between. But here's perhaps something more surprising: 54 percent of boomers use laptops to make consumer-packaged-goods purchases, per Millward Brown. Check out the researcher's full infographic here. 8. Underscoring how women are moving up in ad tech, 41 percent of AOL Platforms' staff is female. 9. IBM and eConsultancy teamed up for research that revealed only 21 percent of consumers said communications from brands are "usually relevant," while only 35 percent said messages from their preferred retailers are "usually relevant." In other words, marketers still need better analytics. 10. LinkedIn last week purchased online education company Lynda.com for $1.5 billion. The move is seen to be an immediate revenue booster for LinkedIn, since its new acquisition is reportedly already profitable in the lucrative digital learning space.